UPDATED: Fee-waived adult cat adoption drive starts on Boxing Day! 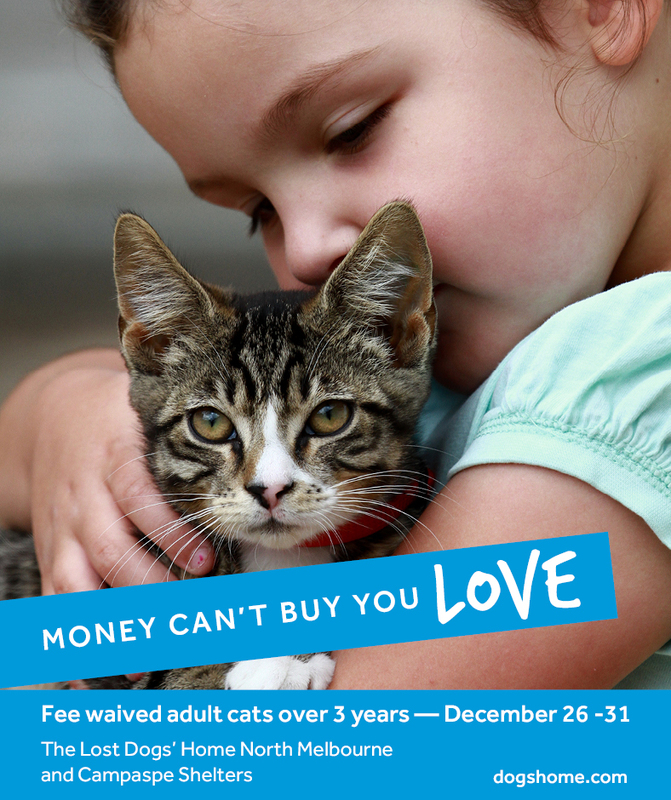 We are pleased to announce we will be extending our Fee-Waived and Half Price Adult Cat Adoption offer to January 4, 2015 to give our many, lovely adult cats a helpful paw-up with finding a new home. We currently have over 100 adoptable cats who sadly continue to be overlooked in favour of their younger counterparts. It is important to us that all cats go to forever, loving homes, so to qualify for the special adoption offers potential adopters must successfully complete the Pet Licence Test first. If they are renting they must also provide evidence they have landlord approval to own a cat. Our Half Price Adoption Offer for cats aged 6 months to 3 years will also be extended to January 4. Starting on Boxing Day — when empty boxes are in abundance making it arguably the merriest of days for cats — we are launching fee-waived adoptions to help find homes for the many adult cats in our care, who sadly are being regularly overlooked in favour of their younger counterparts. “Cats simply love boxes, there’s no denying it!” said shelter operations manager Jodie Addamo. “They transform what would usually be tossed into recycling, into hours of entertainment not only for themselves – but their owners too! With over 100 felines currently up for adoption and more waiting, Shelter Operations Manager Jodie Addamo said the Home’s North Melbourne and Campaspe Shelters were overflowing with beautiful, affectionate cats in need of a home. Ms Addamo said while the Home had offered half-price adoption fees for cats aged over six-months for almost two weeks, only a small number had been adopted, with some cats entering their second month of waiting for a home. View all our cats today and please share the promotion with your friends and family! This offer only applies to cats aged 3-years-old and over. If you are renting, you will need to provide a rental agreement indicating you are permitted to keep a cat in your home. Please Note: Our Chill out with a cool cat half-price cat promotion continues for cats aged 6-months to 3-years-old.